I was at re:Invent in Las Vegas a few months ago, and my favorite part about our annual conference also happens to be what I enjoy most about my job: meeting with customers and learning not only how they use our services, but also how they would like to see them improved. One evening after a day of great talks I spent some time with engineers from a company who use CloudFormation to provision and manage pretty much every part of their application, from VPCs for both dev and prod environments, to the EC2 Instances that run their app. They had a particularly interesting use-case that involved CloudFormation and Elastic IP (EIP) addresses that we’re going to focus on today. When you create a stack including the above template snippet, CloudFormation creates a brand new EIP (i.e., you don’t know the address in advance) per the IPAddress declaration, then the Ec2Instance resource, and finally associates the address with the instance. When you delete the same stack, CloudFormation removes the EIP association, then terminates the EC2 instance and deletes the EIP. Here’s where the customer’s use-case gets interesting: the EC2 instances they were provisioning and managing with CloudFormation are connecting to 3rd-party APIs (for example, a credit card payment processing gateway) that require IP whitelisting. They had previously provisioned a pool of tens of EIPs and gone through the manual whitelisting process with their 3rd-party providers at some point in the past. Although they dynamically provision their VPC and EC2 instances for dev, test, and prod with CloudFormation, they needed the EIPs attached to those instances to come from their pre-allocated pool. Declaring and attaching a "Type" : "AWS::EC2::EIP" resource the standard way wouldn’t work for their scenario. Fortunately, CloudFormation allows developers to define Custom Resources for exactly these types of situations. 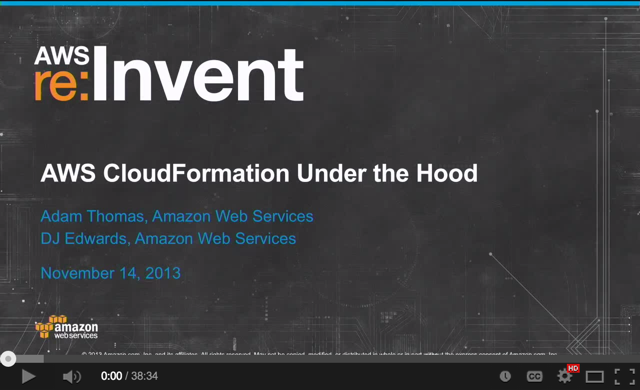 In fact, earlier that day at re:Invent a few CloudFormation engineers gave a great talk on Custom Resources and a framework they released to make developing them easier (video of their talk is on YouTube; I highly recommend you check it out). This customer’s need to provision EIPs from a pool seemed like a great fit for Custom Resources and the new framework, so I offerd to put one together. 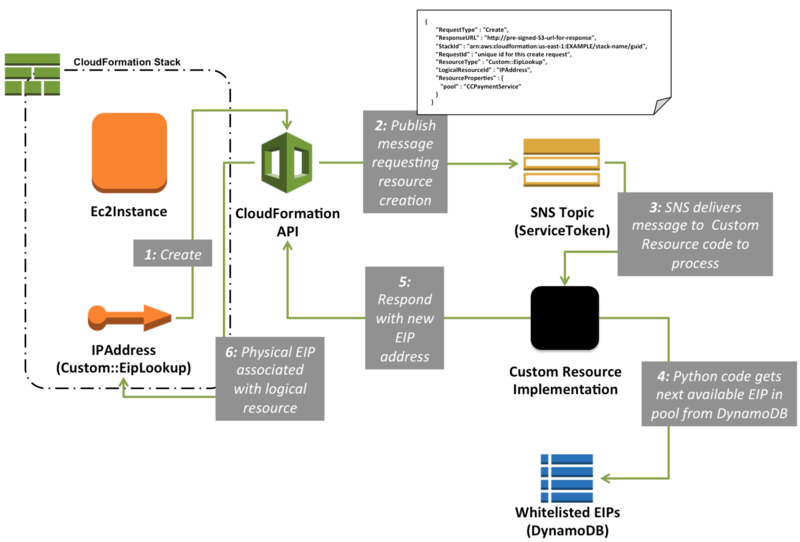 Before we get into the solution, here’s a quick background on Custom Resources: A CloudFormation Custom Resource provides a way for a template developer to include resources in an AWS CloudFormation stack that they define. In this case, the resource is still an Elastic IP Address, but it will be provided by the developer from a pool of existing addresses that they own. The allocation and deallocation of the resource is declared in the CloudFormation template and is part of the stack workflow (i.e., create, update, or delete). By using a DynamoDB hash+range key (you can read more about the DynamoDB data model at http://docs.aws.amazon.com/amazondynamodb/latest/developerguide/DataModel.html), I can retreive all EIPs in a given named pool (i.e., CCPaymentService). 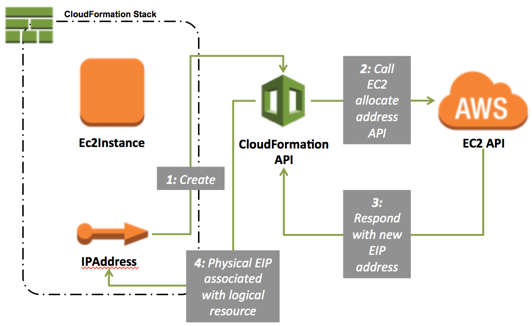 If an item has the stack_id attribute set, that means the address for that item is in use; I can mark an address as ‘in use’ by setting the stack_id attribute to the value of the CloudFormation stack that is using the EIP. """Retrieve an EIP for the given pool from DynamoDB"""
Deleting an address is simply a matter of clearing the stack_id and logical_id attributes for an item. ServiceToken: Required. This is the ARN (Amazon Resource Name) of an existing Amazon SNS (Simple Notification Service) Topic. CloudFormation will publish the contents of the Custom Resource declaration (i.e., the JSON snippet) to that topic whenever a stack is Created, Updated, or Deleted (and will include which of those lifecycle events is occurring). pool: This indicates which pool the EIP should come from, and maps to the Pool hash key in the DynamoDB table. 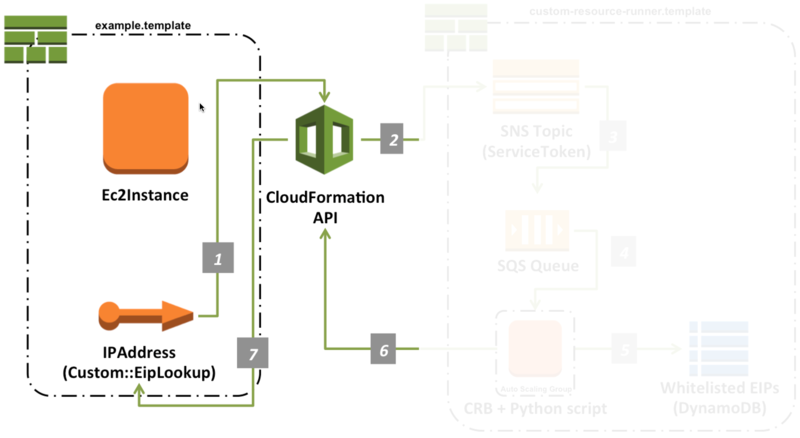 It will be included in the message that CloudFormation sends to the SNS Topic that the ServiceToken points to. 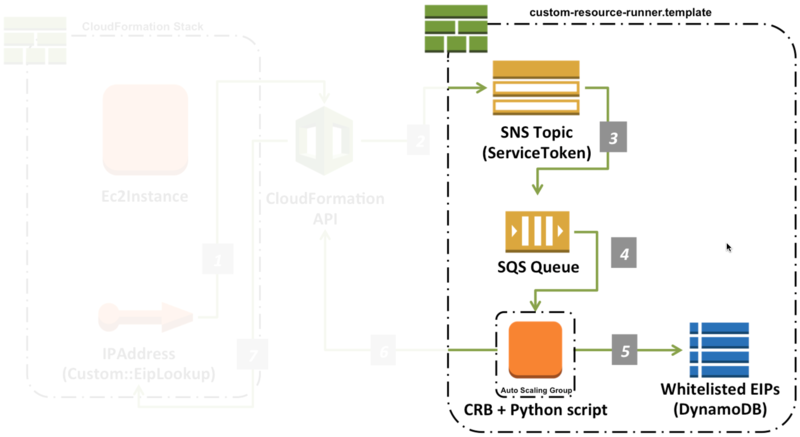 The SNS Topic you use in your Custom Resource’s ServiceToken should have an SQS Queue subscribed. When the CRB receives a message, it will parse the JSON, convert the relevant information to environment variables, and invoke your script. # Write out our successful response! """Mark an EIP as no longer in use"""
Open the EC2 Management Console, click the Elastic IPs link, and allocate a few new addresses. Then open the DynamoDB Management Console, select the EipCustomResource table that was created by CloudFormation in Step 1 and click the Explore Table button. Click New Item and add the EIPs you just provisioned. Use default as the pool name. When you’re done trying out the sample, be sure to delete the stacks you launched and release any EIPs you allocated as part of the trial. If you come up with a cool Custoom Resource you’d like to share, we actively maintain the GitHub repo and love Pull Requests!